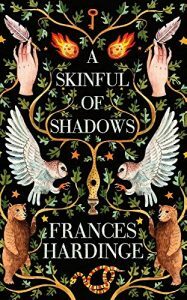 Frances Hardinge has written several young adult novels since her award-winning debut Fly By Night was published in 2005. Her last, The Lie Tree, won the 2015 Costa Book of the Year, the first YA novel to win since Philip Pullman’s The Amber Spyglass in 2001. Set at the beginning of the English Civil War, Hardinge’s new novel follows the trials and tribulations of a teenage girl called Makepeace, who lives in Poplar, then a small village outside London. Makepeace and her mother, Margaret, are reliant on the charity of relatives to put a roof over their head and food (however meagre) on their plates. Hardinge paints a grim picture of Makepeace’s life in a village that is Puritan in all but name. The outlandish names of its inhabitants – Fight-the-Good-Fight, Spit-in-the-Eye-of-the-Devil, Sorry-for-Sin, Miserable-Sinners-Are-We-All – offer an insight into the kind of society in which Makepeace lives. Makepeace senses that she and her mother are different from the other people of Poplar, and just as keenly senses that she must hide any differences lest they be cast out of the village. Secretly, Margaret begins to teach Makepeace how to resist the ghosts of the recently dead who are desperate to find a body to contain them once more. Makepeace is special in that she has spaces in her mind where the dead might hide. If she is taken over by an evil spirit, or too many spirits, Makepeace will cease to exist. She will become a vessel that the spirits will control. Once a month Margaret forces Makepeace to spend the night in a graveyard so that she will learn to resist the marauding ghosts. Makepeace learns her lessons well but just once she lets her guard down and a spirit enters her. This spirit will help and hinder Makepeace as she tries to discover more about her origins. Hardinge introduces some complex ideas about the nature of death and what might lie beyond which in other hands might bamboozle a young reader. However, she explains the crux of her plot well, making sure there are many opportunities for Makepeace to find herself in jeopardy, whether physical or spiritual. With her mother’s death, Makepeace is packed off to her father’s family. Never having known her father, the rich, noble Fellmottes are a mystery to her. She soon discovers a number of strange relatives who frighten her with their dark, searching eyes. She tries to keep herself out of sight, working hard in the kitchen to earn her keep. But things are going on behind the respectable façade of the Fellmottes that spell danger for Makepeace and even her spirit lodger cannot help her. Again and again, she tries to escape the gloomy Fellmottes and then the outbreak of the Civil War suddenly presents her with new opportunities for flight. Although aimed towards the young adult market, this is a well written novel with some extraordinary ideas that may be enjoyed by readers of any age. Hardinge employs enough cliff-hangers to keep the pages turning and her insights into the day-to-day privations in a country at war with itself are fascinating. She has a smooth style and the pages slip by with ease, making this absorbing, substantial novel feel much shorter than it is.